If your car will not start, chances are you have a discharged or weak battery. One way around this is to jumpstart your vehicle. Knowing how to jumpstart your car is a skill any driver should possess. Batteries going dead can happen from leaving a light on in your car, or from your car battery is too old. You do not want to be stranded in the middle of nowhere and calling roadside assistance if a simple jumpstart is all your car needs. Jumpstarting a car can be dangerous. When done carelessly, it can result in injury or damage to your vehicle. Refer to the owner’s manual of both vehicles for any special instructions. Wear gloves or safety goggles when attempting to jumpstart a car. #1. Prepare your jumper cables. Jumper cables are an item that should be included in your driving emergency kit at all times. If for some reason you do not have them in the vehicle, pray that the motorist who stops by to help out also carries jumper cables in their car. #2. Park the cars or put them in neutral mode next to each other. Ensure they are not touching. Turn off both cars’ ignition. Take the keys out to make sure nothing accidentally happens. Then, open the hoods. #3. 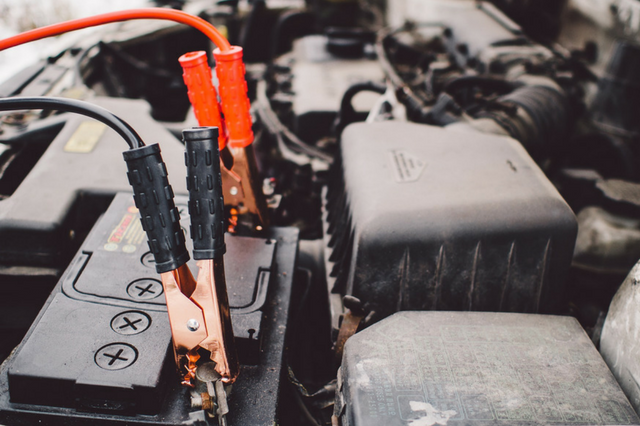 Attach your jumper cables to both car’s batteries. 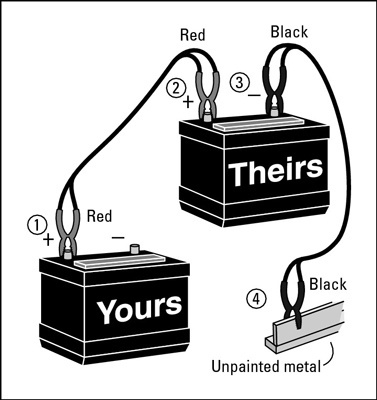 Connect one of the red clips to the positive terminal on the working car’s battery and the other red clip to the positive terminal on the flat battery (your car’s battery.) Connect one black clip to the negative terminal on the working battery and the other end to an unpainted metal surface on your vehicle that is not sitting near the battery. #4. Start the working car’s engine. After a minute of running the working car, try starting your car with the dead battery. If it does not start, make sure the jumper cables are properly attached. Ask the other car’s driver to keep his engine running for five minutes but make sure to switch it off when the battery terminals become too hot. #5. Try starting your car again. If the vehicle still will not budge, time to call the professionals for help. Your car may be in far bigger trouble. #6. If the jump successfully gets your car running, do not immediately shut off the engine. Keep it running for several more minutes to keep charging the battery. #7. Remove the jumper cables in the reverse order you attached them. Take extra care to keep the ends separated and to not touch any metal surfaces. #8. Drive around for at least 30 minutes or keep the engine running. This will make sure your car's battery will not be dead when you come back later to start it again. Just the idea of jumpstarting a car can be daunting for a teenage driver, but it is a valuable roadside skill that can get them out of sticky situations. If you are looking for a driving school in Colorado that will teach Denver’s driver’s ed to your teenager, Western Slope Driving Institute employs driving experts and former law enforcement professionals to help students with practical skills that will benefit them for life such as parallel parking tips. Get in touch with us today for any questions you may have.